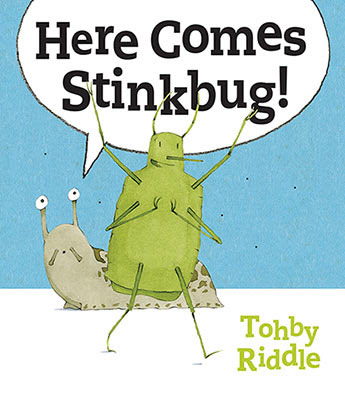 Kids' Book Review: Review: Here Comes Stinkbug! Does a stinkbug really stink? Yes, and the stinkbug in Here Comes Stinkbug! certainly does. This stinkbug stinks a lot, and badly. It's such a stink that the other insects -- worm, lady beetle, bumblebee and others -- are quite put off. They sometimes even feel a little sick. Unfortunately for stinkbug, the stink is so bad that the other insects can't always stand it enough to stay around him. Leopard slug talks to stinkbug about his offputting smell, so stinkbug decides to do something, attempting to make more judicious use of his stink. Although stinkbug becomes careful about how he uses his stink, when he encounters a duplicitous spider, he finds the perfect use for it. Here Comes Stinkbug! is illustrated with a mostly green palette, in keeping with the insects and their environment, and makes use of speech bubbles in telling the story. This gives it a kind of comic strip feel, which suits the humourous approach to the story, and Tohby Riddle's cartoonish illustrations are appealing. Stinkbug's tale is a a fun way to introduce insects to young readers, and encourage them to discover the different traits of each. Author and illustrator, Tohby Riddle has provided downloadable notes about Here Comes Stinkbug! which explain how the apparent simplicity of the final story, is the final result of many drafts, and that there are multiple layers to it, including both typeset narrative and handwritten dialogue.